Erected by Mary his wife 1855 Requescante in Pao 2007. Mark Welsh holding a piece of paper on the chain against the locked door of the Charles Clarke Vault. 2007. During a trip to visit my family in Ballynahinch Northern Ireland in 2007 my cousin Mark Welsh knowing my love of a quiet walk-about in old cemetaries planned a day trip for us to go for hike through one of the oldest cemetaries at the foothills of the Mountains of Mourne, Maherdrahl cemetary. When we came upon this tomb, Mark noticed the lock on the chain was on the inside of the cast iron door. He placed a piece of paper from his pocket behind the chain to show that it was pulled tight, but from the inside. Through the wear and tear of the effects of changing earth and dampness, the door was jammed tight. Curious as to see what was inside, I put my camera lens on the little cross negative shapes of the relief design and clicked with the flash on. The shot came out black. We continued on our journey, all the while sharing our thoughts of how this chain could have been locked from the inside. When we returned to Ballynahinch, we went to the nearest camera shop to put the film chip on a disk. While there, I saw the black shot and for curiosity began to edit the image by flooding light onto the dark negative. We were both astounded. The black negative after editing it with light intensity, revealing a presence within the crypt 2007. We looked at each other with amazement and decided to make a return trip to the Lochinisland cemetery to investigate the name and dates and obituary of the deceased. This time Mark held the camera with the flash burst on, at the small cross negative shape on the door while I viewed the screen as the flash flooded the crypt. The skeletal remains of two separate beings were presented in the bright flood of the flash. 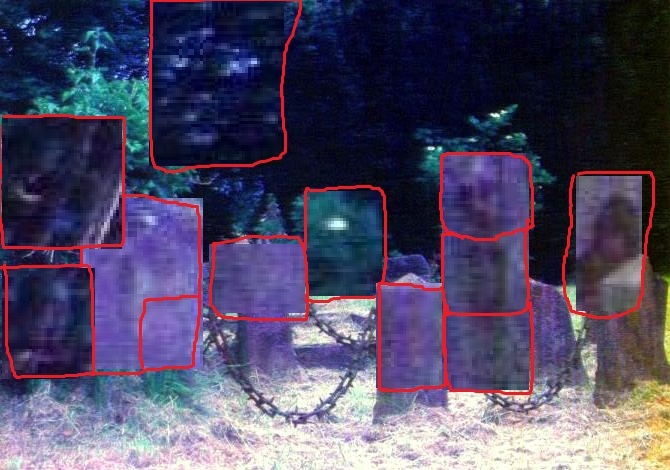 When viewing the photo through the computer graphics, I could not help but notice that there were a series of scored lines in the stones of the head wall over the crypt on the left six in a row with a cross through them as if the days of the week were counted until eventually they were unrecognizable. I also noticed that the remains on the right had smaller bones in the centre of the figure as well as a possible jewelry ring that rested on the earth directly under where the arm would have been from the body on the right. Perhaps the ring had fallen off the finger of the figure upon the natural deterioration. Could it be that the figure on the right was a woman with a child in her arms? Perhaps the figure on the left would have been a male figure that carried the bodies on the right to rest in the tomb and then enclosed himself as well in his grief and loss, with the pain of departure being too much to bear? How would we ever know, lest the story be written somewhere? Mark had brought to light that the original remains of the family crypt would most likely be under the red brick ledge, leaving the figures on top to be the possible descendants of the original George and Mary Clarke. The vault door states that George Clark died at 60 and his loving wife Mary followed him at age 56. To this day I cannot help but wonder who then belongs to these remains? The Unknown Family, Magheradrool Cemetery Lochinisland 2007. There were no names or obituaries left on these stones that were found on Lochinisland weathered by time, yet the very symbol of the spiked link chain that is left leaves us to know this family is united, linked together forever-after and will come back to earth to be united once again. This is a very powerful, family blood epitaph that our close relationship and commitment of family can and does survive… if we want it to, sometimes even if we do not. The message remains plain for us all to see. What was... is. What is... will be. What will be, will be. Mark and I stayed a good few minutes pondering this meaning and Celebration of Life and Love. As we walked away, both Mark and I could not help but turn around for another inspired glance at the testament to true love in the here and after. This is the first time these photos have ever been viewed by other than Mark and myself. It feels so safe here Theresa that I felt compelled to share this secret today, I am sure that Charles Clarke and is loving family would approve while blessing us all.